Many contemporary Christians tend to make one of three errors when dealing with art: One, we declare anything that doesn’t explicitly proselytize, anything that depicts brokenness without redemption to be depraved or unworthy of Christian notice. Or two, we decide that the secular world really does have better art, so we copy it, boldly and without apology or thought into our own creativity. Or three, we try so hard to be relevant that we adopt the attitude and worldview of the culture that surrounds us—instead of being the proverbial salt and light, we end up as dust with nothing to offer in the way of hope, because there is only a perfunctory difference between those of us who claim to follow Christ and those who don’t. The first position emerges from a utilitarian view of art: if the lyrics don’t say “God” or “Jesus” somewhere in the song, the writer can’t really be following Christ. If the film doesn’t portray the apocalypse or a Bible story, producing it is a waste of money. And heaven forbid we depict real suffering or anything that’s not rated PG. In this view, the quality of the art doesn’t matter. What matters is being family-friendly and getting people “saved”—never mind that this tactic turns art into propaganda and produces work of dubious effectiveness in terms of reaching outside the Christian subculture. Don’t misunderstand—there is a place for explicitly Christian art and age-appropriate material, and many of the masterpieces do focus on biblical themes. But to assume that all art must conform to this model is frustrating to artists who have an allegiance to Christ yet want to produce work that speaks to the entirety of the human experience. And it deadens the critical thinking capacity of people in the Church, deadens their ability to see and experience part of the nature of God. It also leaves many hurting, unable to ask for help or even admit their failings—what they see in the Church is happy music and people with seemingly perfect lives. Once a new creation in Christ, suffering and pain disappear, right? Wrong. Let’s be honest and admit it. The second position acknowledges the deficiencies of the first. Tired of seeing the Church so out of touch with society, it attempts to bring society into the church. “Do you like Radiohead? How about OutKast? We do too! 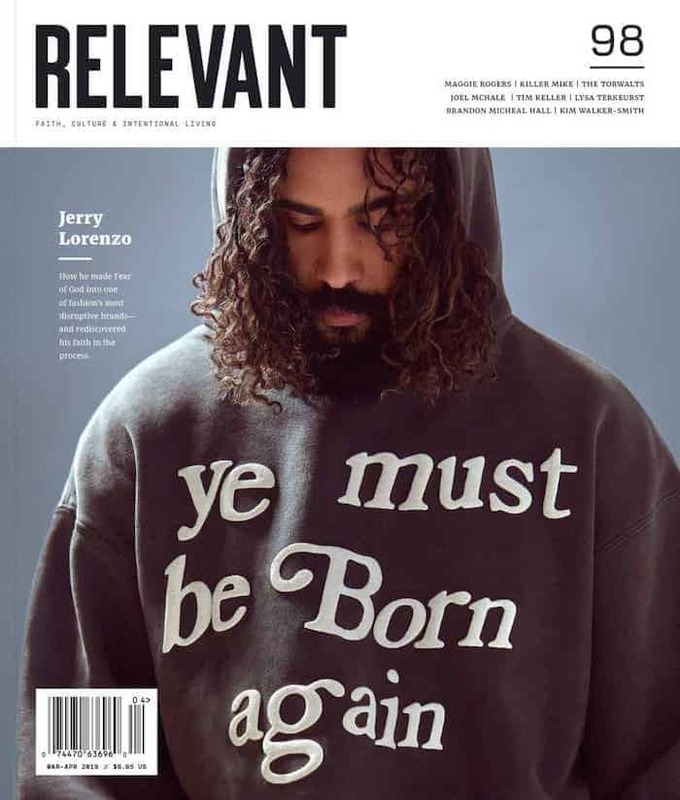 See, we’re cool, we’re relevant.” In an attempt to be “hip,” designers borrow the logos of existing brands, replacing company names with Christian phrases and emblazon the results on T-shirts, PowerPoint presentations and church bulletins. Bored with the current palette of praise songs (admittedly these are often another exercise in uncreative musicianship), the worship team brings U2 into the sanctuary. (Even if they are Christians, the point is that this maneuver is still borrowing a band from secular culture and dressing it up in church trappings, similar to what much praise music does.) This approach reeks of laziness and a disregard for creativity, one of the aspects in which humanity is imbued with the nature of God. Tolkien and Lewis speak of man as sub-creator—the ultimate Creator is God, but man creates in a smaller way, using existing creation to make something new. But instead of investing the time and energy to come up with original material or original thought, or even using the rich material from ages past, Christians here become poor imitators, offering no real commentary on the human experience and why Christ might be relevant to it. The last position is born out of frustration with the first (and sometimes the second). Tired of being marginalized in the Church and afraid they won’t be accepted in either a secular or religious world, artists disassociate themselves from the label and praxis of Christianity because their work is unacceptable by church standards—and in the mainstream, “Christian art” translates into “bad art.” Few empathize with this position on the fringe of two worlds, so they drift. Cynical from their past experiences with hierarchy and legalism, followers of Christ become reluctant to define their beliefs at all, leaving only spirituality with a vaguely Christian twist. In an effort to sound intelligent in a world that mocks supernatural belief, Christians downplay doctrine and theology. While there are many things to be learned from tradition and the ways of the high church, the Celts and whatever group happens to be in vogue, these beautiful, artistic expressions of faith should point toward something higher than themselves, should point to God Himself as a specific, personal entity rather than an enigmatic deity or ambiguous spirituality. Without Jesus on the cross, His death and resurrection, God entering history in a specific, historical period, Christianity simply doesn’t exist. Without Jesus, we’re left with a religion that may feel good, but is powerless to save, to transform, to make new. What we need is art made with excellence—art that reflects the joy, suffering, pain, brokenness, hope in the world around us, even art grounded in a Christian worldview—and a Church that supports it. This art may come from Christians, but we should recognize that it may also come from people who do not know Christ. In its essence, art is the expression of human emotion; true art reminds us that this temporal existence is not the end, that there is something greater, something this world cannot satisfy. It cannot help but call us to God if we only follow its calling. In this way, art is a connection, a connection deeper than mere brushstrokes on a canvas or images on film.